Condensate recovery pumps suitable for use in high-lift closed recovery applications and mechanical applications where the use of electric power is not possible. Available models transport condensate via suction or via the flow of gravity. Condensate recovery pumps with motorized condensate transport. Condensate recovery pump with integral trap requiring no electricity. Condensate recovery pumps requiring no electricity. A broad line-up of condensate recovery equipment optimized to suit each condensate recovery application and capacity. 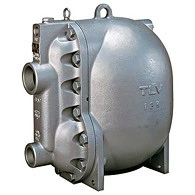 Included are ejector-type pumps for the recovery of high temperature condensate, mechanical pumps that use no electricity (PowerTrap®), and vacuum pumps suitable for the recovery of low-pressure, low-temperature condensate. Comprehensive consulting services for optimized condensate recovery systems, including onsite surveys, measures to ensure water quality, system design, pipeline construction, and confirmation of results. Recovers high-temperature condensate and delivers it to another location. Collects, removes, and transports condensate that has accumulated inside the equipment.